If this option is selected, the currently open project will be saved before it is run. If the project has not yet been saved, or cannot be saved in its current location, a "Save As..." dialog will be opened. If this option is selected, the Action Property pages dialog will open automatically whenever a new action is added to the project. If this option is selected, the last loaded project will open automatically whenever FinalBuilder starts up. If it is not selected, a new (empty) project will be opened. If this option is set, the FinalBuilder IDE's window title will be the full path to the project file instead of just the file name. Similar to the previous option, if this option is set then the File -> Recent menu will show full project file paths instead of just file names. You can choose from Office 2003 or Office XP style toolbar icons. You can choose the maximum number of projects to be shown under the File -> Recent menu. 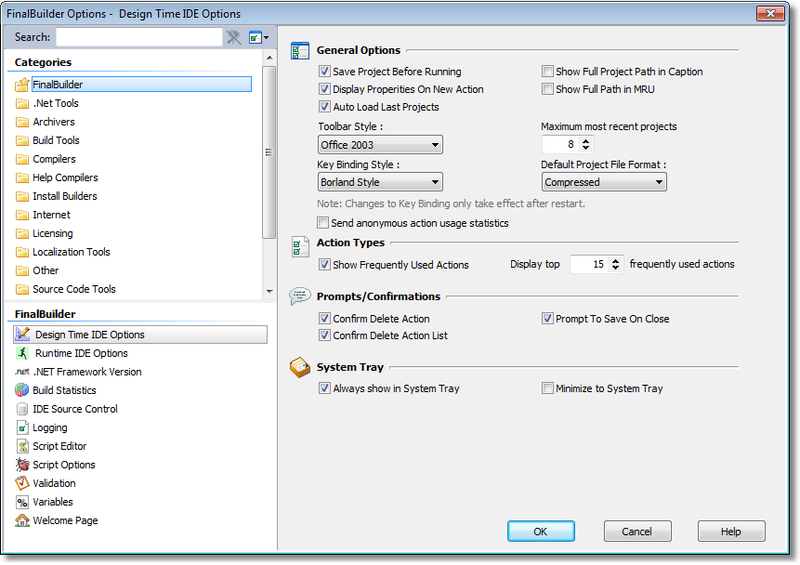 With "Microsoft Style" key bindings, F5 runs the build, F9 toggles breakpoints, and F10 steps. With "Embarcadero Style" key bindings, F9 runs, F5 toggles breakpoints, F8 steps, and so forth. When changing this option, you must restart FinalBuilder for the change to take effect. If "compressed", projects are saved in the compressed .fbz7 format. Otherwise they are saved in the uncompressed .fbp7 format by default. See Automatic Action Usage Updates. If this option is selected, then the "Frequently Used" action type category will appear in the action types list. You can also set how many actions to show on this list. Select whether you wish to see a confirmation dialog before deleting actions/action lists. Select whether you wish to see a "Save Project First?" confirmation dialog before closing an open project, or starting a new project. Note that disabling these options can easily result in loss of data. Enable this option to see a "Tip of the day" on the Welcome Tab when you start FinalBuilder each day. FinalBuilder can show an icon in the system tray. You can choose whether to not show the system tray icon, or to only show it when FinalBuilder is minimized. Double-clicking on the system tray icon will restore the FinalBuilder IDE as the current focused application. Causes FinalBuilder to be minimize to the system tray rather than the taskbar when minimized.